FIVE PURE SILVER PENNY PROOFS - ALL UNIQUE IN CANADIAN HISTORY! Low mintage, too - only 5,000 total sets! It's like losing a friend, someone who's been there all your life - the penny is no more. Canada has made the momentous decision to eliminate the one cent denomination, and we are sad. One of the three most collected of Canadian coins along with the dollar. , the penny has been a cornerstone of Canadian (and North American) commerce since the earliest colonial times. Now, the bureaucrats and bean counters in their offices say it costs too much to manufacture - more to fabricate, in fact, that its face value. But not before one final flourish. The Royal Canadian Mint celebrates the much-loved penny's exit from the financial stage with a spate of releases at once exotic, bizarre and intriguing. Rose-Gold Plated 1/2 Ounce Pure Silver 1¢ Penny Proof. 1/25 Ounce Pure Gold 1¢ Penny Proof. Complete 5-Coin Collection - Remembrance of Designs Past Pure Silver 1¢ Penny Proof Set. Five Ounce Pure Silver Penny Reverse Proof. With what (we believe) future numismatists will view as numismatic delicacies of the first rank! Each bears the maple leaves. That are the hallmark of the penny (as well as the national symbol of Canada), marking the final time they will ever grace one cent coins. But oh, what coins these are! We can not stress strongly enough what the milestone discontinuation of the penny means! Canada has eliminated this denomination permanently - after 2012, there will be no more one cent coins, ever! These five, pure silver penny proofs are unprecedented and unique in Canadian history! The throwback or retro portraits make these coins even more unique and desirable! We believe that this landmark set will become a numismatic delicacy, greedily pursued by future generations! The mintage limit is low, so stock up now! Don't forget these other two great Canadian Silver Sets! 2003 Hologram Silver Maple Fractional SML Set. 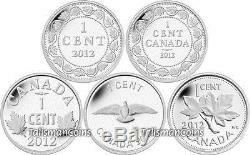 2013 Silver Maple Leaf 25th Anniversary Fractional SML Set. Five Pure Silver Pennies - Unique and Unprecedented in Canadian Numismatic History! The year 2012 marks the end of production of Canadas 1-cent piece. To celebrate the pennys long history, the Royal Canadian Mint is offering a series of commemorative pennies, each struck in pure silver with a proof finish. Together, these trace the history of the denomination. Though the reverse and obverse design of this penny predates the Royal Mints presence in Canada, when the first coin was struck on Canadian soil in 1908, it was a penny just like this one. The reverse features the maple wreath design that had been present on Canadian 1-cent coins since the Victorian era, framing a central field featuring the words ONE CENT and the year of production. The obverse features the effigy of King Edward VII. In 1911, George V became king and the obverse of the Canadian 1-Cent coin changed to feature the effigy of the new monarch. At the same time, a new reverse design featuring the word CANADA was introduced. In 1920, the Royal Mint not only made the penny smaller but also introduced a new reverse design featuring two maple leaves and the words ONE CENT and CANADA. The obverse continued to feature the effigy of King George V, though complications in 1936 caused by the abdication of King George V s successor, Edward VIII, led the Mint to modify the 1936 dies in order to produce never-circulated George V dot cents in the event of a delay in production of 1937 coinage. To celebrate Canadas centennial, Canadian artist Alex Colville created a special commemorative reverse design for the penny featuring a rock dove in flight. The design featuring two maple leaves. On a sprig was created by Canadian artist G.
Kruger-Gray and first used in 1937. Originally composed of copper, 2012's one cent circulation coin is made of copper-plated steel. In 1982, the shape of the penny was modified from perfectly circular to a 12-sided design to assist the visually impaired. This shape was maintained until 1997, when the penny became round again until its final striking in 2012. The Penny - A Brief History. The maple leaf gracing the one cent coin is emblematic of everything Canadian. The maple tree has been a major contributor to the development of the forestry industry as well as a source of delicious syrup! In addition the maple leaf is the central feature of the national flag of Canada. The first one cent coin was struck by the Countess of Grey at the official opening of the Ottawa branch of the Royal Mint on January 2, 1908. The Death of the Penny. Todays rising costs of labor, metals, manufacturing, and distribution mean that each penny. Costs more than 1.6 cents to produce. 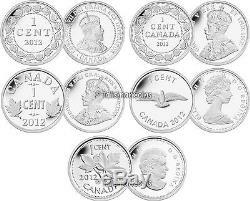 The Royal Canadian Mints patented and cost-effective multi-ply plated steel technology allows it to keep production costs for all other Canadian circulation coins well under their face value; not so, however, for the one-cent piece. In its Economic Action Plan 2012, the Government of Canada announced its decision to modernize Canadas currency set by eliminating the penny from Canadas coinage system. While the penny will remain legal tender (it is not being demonetized, merely discontinued), the Royal Canadian Mint will no longer distribute pennies as of Fall 2012. Canadians can still spend pennies, redeem them at financial institutions, donate them to charities, or recycle them. Though the humble penny will one day soon disappear from piggy banks and cash registers everywhere, its unique role in the history of Canadian coinage remains timeless. Itself, though perhaps no longer present in our pockets, will always hold a special place in our hearts. There are tens of thousands, if not hundreds of thousands, of Canadian penny collectors. And yet there are only 5,000 of these one cent sets - and they're the only way to get these very special pennies! Each penny is found only in this set, and each is struck in the purest silver. Refined anywhere in the world. Making each even more special, each is a proof strike, with a retro design that commemorates the historical type of Canadian pennies of decades past. All future generations of penny collectors will need these coins to assemble a full type set or date set. Don't let this complete 5-coin collection sell out on you, get yours today! The Royal Canadian Mint refines the purest silver in the world. Each of these unique one cent coins is 99.99% pure! See "Individual Coin Specifications" table below for more information. Each coin is encapsulated inside a luxurious, solid wood presentation case, lined with black velvet and protected by a full color, custom box. An individually-numbered certificate of authenticity is included. 5 Cents (5 x 1 Cent). 14.70 g (5 x 2.94 g). 19.10 mm (each coin). Making Change: The Story of the Canadian Penny. On the stage of Canadian currency, the humble penny has often been considered a bit player. It lacks the quarters size, the dimes diminutive prestige, the nickels shining patina. Though ubiquitous, the penny has always been a breed apart. But the life story of Canadas 1-cent piece is anything but dull. It is a story that not only traces the history of Canadian currency, but in many ways walks arm-in-arm with the narrative of Canadas evolution from imperial outpost to dominion to independent nation. On January 2, 1908the day that the Ottawa branch of the Royal Mint was itself freshly mintedCountess Alice Grey, wife of Canadas ninth Governor-General, Albert Henry George Grey, stepped forward and struck Canadas first domestically produced coin: a 1-cent piece. By 2012, more than 35 billion more would be produced. Todays rising costs of labour, base metals, manufacturing, and distribution mean that each penny costs more than 1.6 cents to produce. While the penny will remain legal tender, the Royal Canadian Mint will no longer distribute pennies as of Fall 2012. Though the humble penny will one day disappear from our midst, its unique role in the history of Canadian coinage remains timeless. And the penny itself, though perhaps no longer present in our pockets, will always hold a special place in our hearts. Talisman World Coins and Medals has been in business for more than 20 years and is one of the largest world coin direct distributors and wholesalers in the world. The item "Canada 2012 Farewell to Penny One 1 Cent Pure. 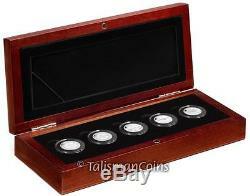 9999 Silver 5 Coin Proof Set" is in sale since Thursday, January 24, 2013. This item is in the category "Coins & Paper Money\Coins\ World\Australia & Oceania\Australia\Commemorative". The seller is "talismancoins" and is located in Saint Louis, Missouri.